A visit to the Grand Village Shops will let you feel the magic and wonder of Christmas as soon as you walk through the doors of Kringles Christmas Shop. With 9,000 square feet of Christmas items and collectibles to browse in six great rooms, you are sure to find a Christmas gift you are looking for. Shopping in Branson can be exciting when you shop at the largest Christmas store in Missouri. 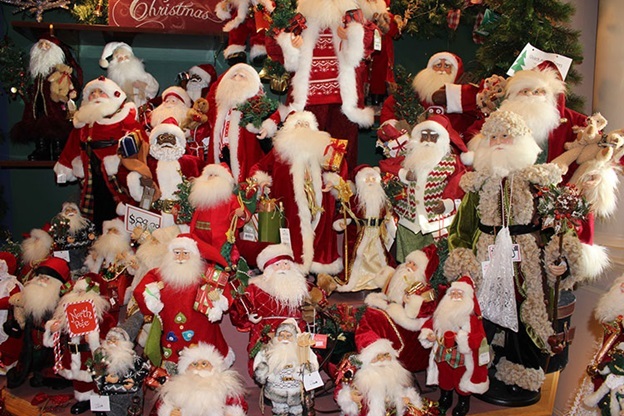 This Christmas shop has the largest selection of collectibles in one location in Branson. Don’t miss to check an awe-inspiring collection of 125 designer decorated themed trees and one-of-a-kind handmade Santas complete with magical atmosphere. Kringle’s Christmas Shop offers a wide display of Kringles Collectibles, Kringles Glass, Kringles Ornaments, Kringles Village Collection, and Kringles Keepsakes. The shop also features a multitude of brands such as Clothtique Possible Dreams Santas, Fontanini Nativities, Annalee Dolls, Olive Wood from Bethlehem, Byer’s Choice Carolers, Christopher Radko, Mark Roberts Fairies, Karen Didion Santas, Steinbach Nutcrackers, Jim Shore, Disney and several lines of locally made ornaments. Kringles Christmas Shop is a one stop store that is filled with great ideas for Christmas decorations year round. At Kringles Christmas Shop, you will feel the spirit of the holiday season as you step inside the store and see the wonder of Christmas shopping in Branson. Visiting this Christmas shop at the Grand Village Shops offers you great holiday shopping in Branson where you can find specialty items such as unique fashion apparel, fine arts, jewelries, and men’s and ladies’ accessories. This shopping spot is a great place to stroll around as the area features beautiful landscape with benches for great relaxation. If you like shopping during the holiday season, you’re sure to appreciate the wide display of holiday decorations and a wide variety of unique shopping items. This wonderful Christmas shop also features beautiful store for kids, a bookstore, and a nice little café. Christmas Hollow is another shop at Silver Dollar City which offers unique Christmas themed items. In this glorious Christmas shop, the holiday season is celebrated every day. As far as your eyes can see, you will find holiday decorations in every corner, twinkling lights and ornaments, snowmen, snow globes, and Santa and stockings. The shop also offers great collectibles from Old World Glass and Roman, as well as handcrafted olive wood figurines from Earth Woods. You can also find a wide variety of holiday decorations and ornaments at Jingle Bell Junction. This store has over 80 themed Christmas trees that feature ornaments of different shapes, colors, and sizes. Some great items that you can find at Jingle Bell Junction include western themes in traditional styles with illuminated ornaments. The store also features a convenient parcel service, where your purchases will be brought to the front of the park to pick up on your way out. Kringles Christmas Shop and other Christmas Theme Shops at Silver Dollar City feature a complete range of Christmas ornaments and decors that you need for your home.